If you have been thinking about having cosmetic or restorative dentistry, we understand you will have lots of questions. That is why we are pleased to offer you a complimentary consultation ( worth £130) ) with one of our experienced dentists at Parkway Clinic. They will be able to address your queries and outline some treatment options that may be suitable for you. Your FREE initial consultation will be with one of our dentists for 30 minutes and is limited till the 28th of December 2018; This includes the x-rays. The suitability of options discussed will ultimately be dependent upon your clinical assessment with our dentist. This initial visit will allow you to see the clinic, meet the team and discuss your concerns and requirements. After this consultation, we can then advise you of the appropriate options for you and help you with a way forward towards optimal oral health and a smile that you have longed for. General Anaesthesia is a state of controlled unconsciousness where medications are used to send you to sleep. You are unaware of the surgery and will not feel any pain or discomfort . It is administered by inhalation or intravenously . Sedation is a depression of awareness between a relaxed consciousness and being very sleepy . It is administered by medication being given by inhalation , intravenously or by mouth . It requires a numbing of the site of surgery with local anaesthetic . 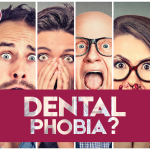 Visit this page for further information about how we can help with dental phobia. Beverly on General Anaesthesia or Sedation?